The Government of Bangladesh under the leadership of the Food Planning and Monitoring Unit (FPMU), Ministry of Food has launched a series of policy consultations with governmental and non-governmental stakeholders and partners to obtain initial feedback to and seek cooperation for the formulation of a Bangladesh Food and Nutrition Security Policy (BFNSP) as set forth by the Seventh Five Year Plan (7FYP). In this regard, the fourth consultation was held with the General Economics Division (GED), Planning Commission on 25 March 2019 at Nazia Salma Conference Room, Planning Commission. Apart from discussing approaches to the formulation of a BFNSP, the consultation was aimed at reflecting the National Social Security Strategy (NSSS) and other relevant issues in the new policy. Mr. Faizul Islam, Joint Chief, GED and Project Director of SSPS Programme made a presentation on Provision For Food & Nutrition in the Context of National Social Security Strategy (NSSS). 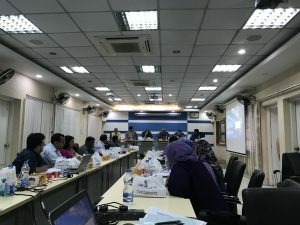 It is to be noted, prior to this meeting, three rounds of consultations were organized with the International Food Policy Research Institute (IFPRI), Agricultural Policy Support Unit (APSU) of the Ministry of Agriculture, and the Bangladesh National Nutrition Council (BNCC), respectively.